Mangaluru, Dec 24, 2014: “The festival of Christmas is not confined to just one community. The celebration of the Birth of Jesus Christ becomes more meaningful when everyone comes together to be a part of the celebration,” said Rev. 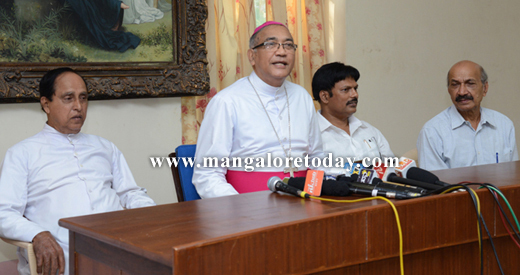 Dr Aloysius Paul D’Souza, Bishop o Mangaluru Diocese in his Christmas Message at the Bishop’s House here on December 23, Tuesday. The Bishop also urged the people to maintain harmony and peace in the society by being compassionate and helpful. The Bishop also stated that as part of its community service initiatives, the Diocese has gifted 24 houses to poor families at Mariashrama, Talapady on account of Christmas. He also stated that as many as 200 inmates of different Ashrams would be offered Christmas meals at Bishop’s House on December 28. Expressing his regret that the city of Mangaluru which was known for its peace and unity has now been marred by violence, unrest and communal tension, the Bishop urged the people to live in peace and harmony. A cake was cut to mark the occasion. 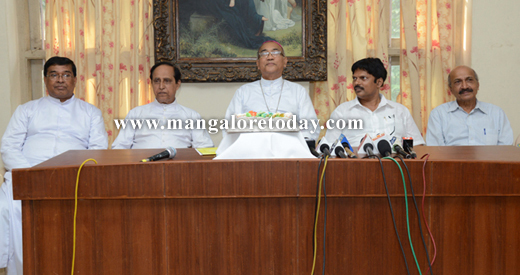 Fr William Menezes, Public Relations Officer of Mangaluru Diocese, MP Noronha, Diocesan General Secretary, Msgr Denis Moras Prabhu, Vicar General of Mangaluru Diocese and others were present.